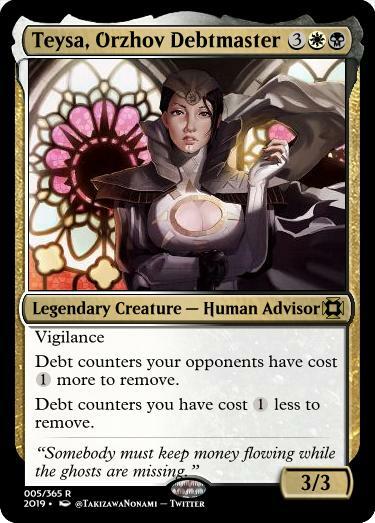 The mechanic Vision Design handed off for Orzhov was called "debt." Here's how it worked. 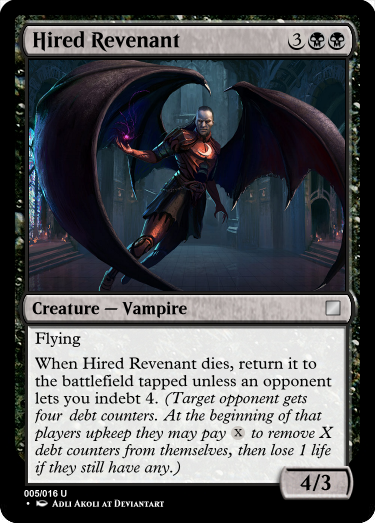 Certain spells would give debt counters to your opponent. 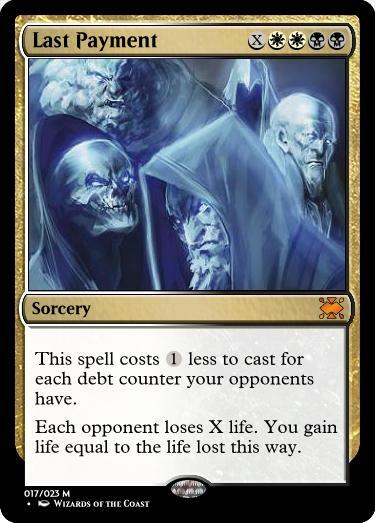 At the beginning of their end step, they could get rid of any number of debt counters by paying 1 mana per debt counter. Then, as long as they had any debt counters remaining, they lost 1 life (not per debt counter just 1 life total regardless of how many debt counters they had). The way it tended to play was that players ignored the debt counters early in the game as they wanted to maximize using their mana. Then, as the debt slowly accumulated, they had to start paying it off, as the continual life loss was starting to become a problem, but often they couldn't pay it off at the rate they needed without impacting their game. Players didn't often die to their debt, but the act of paying it off often put them at a severe enough disadvantage that they'd lose the game. They didn't use this mechanic for reasons that don't seem to be about the mechanic itself but more about the set environment. Well, fellow designers, do you maybe have one or two cool ideas how a card with that mechanic could look like? What do you think of these cards? What about the mechanic as a whole? Do you have some cool ideas you'd like to share? Note that the wording is my creation and if you have a better or less wordy version, then please share it! I love this mechanic much more than Afterlife. Orzhov is my favourite guild loreswise and I would love to play this at a Prerelease. In fact, yesterday I did some cards with the mechanic. It think it has a some nice design space and I will try to use it in a set sometime. Whithout further ado, my cards. These are generally very solid designs, but I do think they illustrate one big issue with debt: it's kind of win-more in that it punishes those who are already behind. If you've missed a land drop or two, you're going to find it harder and harder to pay your debts and still affect the game meaningfully, and, while that's certainly flavorful, I fear it could lead to a lot of grindy, drawn-out games. Hmm, I kinda see your point but doubt that these are really reasons that count debt counters out. Basically, Bloodthirst, Spectacle and other already existing mechanics are also win more and are broadly accepted. Furthermore, grindy and drawn-out games are what Orzhov are about, aren't they? I see the point (and I agree with it) but mana screw tends to make you lose anyways most of the time, so, I don't think is that big of an issue. Also, looking from the Orzhov point of view, it's not my problem they can't pay their debts, in fact, that was my intentiion from the first moment. Well, that card was just a quick idea, she may as well be a build around uncommon for draft or something like that. 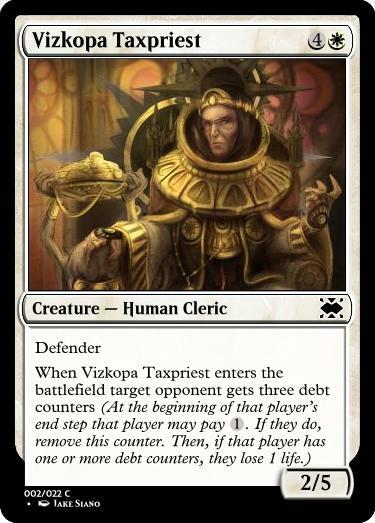 While I know that Orzhov is usually about collecting from others, I think a very simple way to make Debt more interesting would be to turn it on its head. Give yourself debt, in exchange for some form of short-term reward. I think that immediately takes away a lot of the issues. Debt isn't something that is forced upon you, it's something that you take on for yourself because you think you can pay it back, or because the immediate benefit is more valuable to you. This could take a few forms. 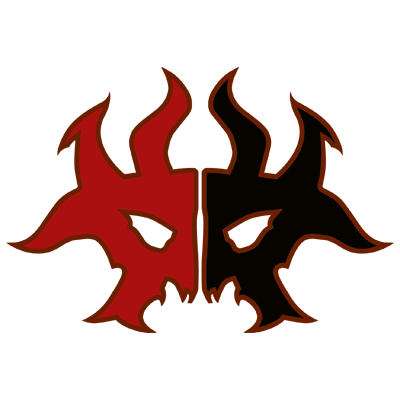 Cards that use Debt as a cost reduction, either optionally, or in the form of undercosted cards that give you Debt. 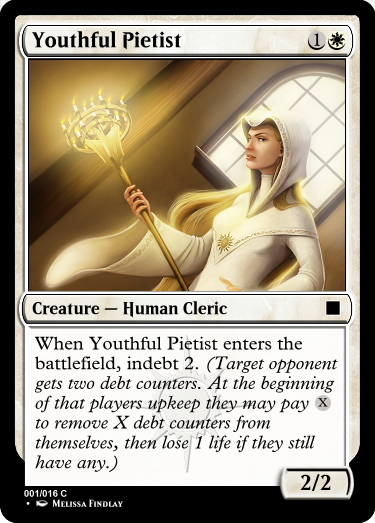 Cards that give an opponent an option to take Debt for some gain, or to prevent/mitigate the card's effect. Cards that turn Debt into a resource. This would probably be mostly on enchantments, though I could see instants and sorceries that trade the likes of mana production or life gain in exchange for Debt as well. This is probably the best way to make Debt work as a mechanic. Everyone here keeps saying things like, "They didn't use this mechanic for reasons that don't seem to be about the mechanic itself but more about the set environment" or "but mana screw tends to make you lose anyways most of the time, so, I don't think is that big of an issue". These are exactly why they didn't use this mechanic and exactly why it is a big issue. It turns a bad start with the potential to turn around into, a long, slow game of inevitable loss, which isn't a fun game. Plus, as kefke says, Debt isn't something you force upon another person, it is because of your own actions that you accumulate debt.